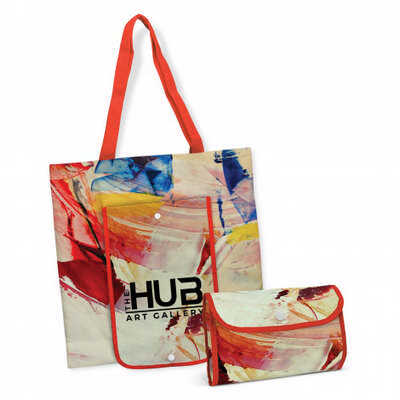 140gsm cotton tote bag which can be folded down into a snap closure pouch for easy storage. When unfolded, the snap closure also functions as a front storage pocket. The handles, binding and stitching are available in 16 colours which will match unless requested otherwise. Georgia is completely customised with full colour branding on both sides as well as the snap closure pocket. A lead time of 15 - 20 working days applies to this product. Colours: Natural, Tan, Gold, Yellow, Orange, Pink, Red, Burgundy, Lime, Bright Green, Dark Green, Teal, Royal Blue, Navy, Purple, Black (PMS colour matches are only approximate). Dimension: H 406mm x W 381mm (excludes handles). Print Description: Please refer to template. Print Type: Sublimation Print. Packing: Loose packed. Less than minimum quantities are not available for this item. For artwork that differs front to back there is an additional $35 charge.. Price includes : Full Colour Print. Setup is included.